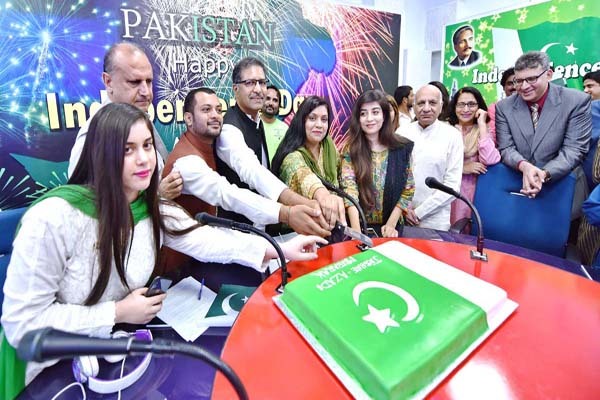 ISLAMABAD, Aug 14 (APP):A special cake cutting ceremony was held on Tuesday at Pakistan Broadcasting Corporation (PBC)’s new and current affairs channel, Islamabad to mark the 71st Independence Day. Caretaker Minister for Information and Broadcasting Barrister Syed Ali Zafar performed the cake cutting ceremony along with Director General Shafqat Jalil and others and prayed for the progress and prosperity of the country. Speaking on the occasion, the minister felicitated the nation on auspicious occasion of Independence Day, saying that he felt proud on being the member of such a great nation. On independence, he said we should have to pledge contributing in the progress and prosperity of the country. The country has given us a lot and once we sincerely pledge contributing something, the country will start progressing. DG Radio extended his heartiest felicitations to Pakistani nation and pledged that the Radio Pakistan would continue serving the country as voice of the nation. The DG said Pakistanis are alive nation and will continue celebrating Independence Day with national enthusiasm. Director News and Current Affairs Javed Khan Jadoon was also present. Renowned singer Mulazim Hussain sung national songs on the occasion.